I hadn’t originally planned to watch Netflix’s She-Ra reboot. The previews hadn’t really grabbed me, and I don’t really have that much TV time. And then I started hearing about complaints from what I’ll call the Manbaby Corner of the internet, how She-Ra was ruining everything by … I’m not exactly sure … I think it was something about female characters who weren’t all designed for the sexual appreciation of straight men? Anyway, the Volume of Manbaby Whining (VMW) score has been a reliable way of finding good stuff, so I went ahead and binge-watched She-Ra. The show is so unapologetic about presenting girls and women with a range of personalities, bodies, strengths, weaknesses, and powers. Some of the secondary characters might feel a little one-dimensional, in part because there’s a limited amount of screen time to go around, but it works. Then the episode Promise comes along, showing us Catra and Adora as little kids, developing that love and loyalty even more, until Catra finally has to make a choice. Damn, that was powerful and heartbreaking. For those who’ve seen it, what did you think? Yes, full agreement. 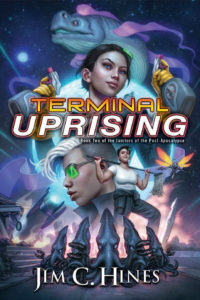 It’s a lot of fun, the characters are engaging, and most surprisingly, they develop over time. Glimmer starts up as a privileged screwup, and learns to be effective by working with Adora / She-Ra (Who has some real problems with Imposter Syndrome herself). And I really love Swift Wind too. He (?) reminds me of Zelazny’s Steel General, only without the grim dark. It was a goddamn delight is what I think about it. “Volume of Manbaby Whining.” Snort. Nice to see that’s good for something. I’m only up to the Mystacor episode, but I’m really enjoying it. 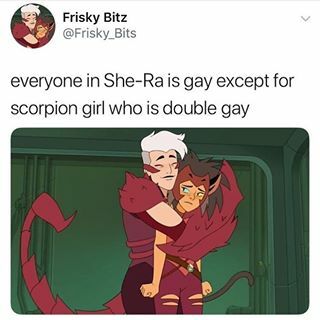 Scorpia is Best Princess. She’s clearly having the most fun, and just wants to be best friends with everyone. Or punch them. There may not be much difference. She’s having fun don’t judge. Serious talk though, this is the best character driven animation since Voltron got its act in gear. Everyone has really believable reasons for being who they are, and basically everything that happens is driven by a personality not a plot convenience. (Also, don’t be too hard on Glimmer, she’s not really a screwup in the context of the narrative, what she wants to do is what ends up being right to do, and her social anxiety issues are classic for an introvert, able to handle social situations only in very familiar contexts with an established relationship with a limited range of people). I had zero interest in She-Ra or He-man when they originally aired (give me Thundercats or Transformers any day). I have zero nostalgia for them. But this reboot I love. I watched mostly because I’ve read Noelle Stevenson’s Nimona and she’s darn good. Only a couple of episodes in though. My daughters (7 and 9) started watching it, so I caught a few episodes. We love it. I’ve laughed out loud at some of the comedic timing. I love the range of characters and wants and quirks; any of them is relatable. Basically my feeling about it is that it was an excellent twenty-episode arc cut down into thirteen episodes, and I keep meaning to write a nice twitter thread pointing out the Missing Episodes. I enjoyed it a great deal, but editorbrain goes poke poke now.